Something odd (for me) happened a couple of weeks ago. I injured myself, doing something that, in hindsight, was dumb, results predictable, and entirely avoidable. 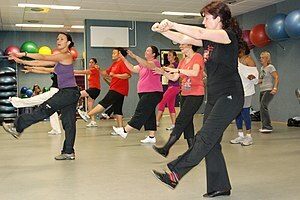 Since Thanksgiving, I’ve been attending a ZUMBA class to get myself back into exercising. As I have felt better and continued to lose weight, I’ve also been taking advantage of the well-equipped workout room at my apartment complex. As someone who really hates almost everything about exercise, this is a big step. I don’t really hate exercise. I love movement: dancing, gardening, walking, playing. I dislike the whole mechanized, impersonal, automated, testosterone-driven exercise scene. The rituals and costumes just don’t do it for me. However, I am convinced of the importance of vigorous exercise every day, and have been getting my head around figuring out how to do that. So a couple of weeks ago, I came home from my Monday night ZUMBA class. I felt really fantastic. My execution of the dance moves was self-scored (I can’t help it!) at about 85%, and I also felt like I had pushed myself, but not too far. I was so energized that I really didn’t feel like eating much for dinner after the workout. The very next morning, I felt so great that I practically skipped over to the workout room. I got on the elliptical machine for a few minutes. This is a machine that I recognize holds great promise for me, and I have to work on my coordination and stamina to master it. After less than five minutes, though, I felt fatigued. This was the moment when I should have stopped. However, I switched over to a recumbent bike and pedaled for about 15 minutes. Usually I can do 30 with no problem, so stopping after 15 was the dawning of my awareness that I should maybe take it easy. I went about the rest of a typical Tuesday, seeing clients and teaching two Awareness Through Movement classes. However, that evening, I was so stiff that I could hardly walk. My right hip felt inflamed, and things did not feel like they were “lining up” in my hip joint. I came home, took some ipuprofen, and went to bed. No position was comfortable. Wow, I thought, I have really done it. I couldn’t roll over in bed without causing a shooting and terrible pain that made me yelp. So, something about the twisting. . .
Here’s where the resilience came in, and the beginning of recovery. The executive summary is, I was better the next day, have not re-injured myself, took some time off from structured exercise, and have returned to my ZUMBA class. Happy ending. The resilience piece is that I started thinking using the Feldenkrais Method. In the present moment, what movements seem to cause pain? What parts of myself am I not including in the movement? Is there an easier way to do what I intend? I slept fitfully that night, but each time I awakened, I moved in mindful ways to make myself more comfortable. I found an easy way to roll over that did not tweak and twist my back. I experimented with other silly variations of the movement, exploring for comfort. By the next morning, I got out of bed, stood for a few moments, and took a few tentative steps. No pain! In hindsight, I realize that I should not have done lower body work so soon after my ZUMBA class. If anything, I should have done upper body work. I returned to class last night, and my continuing experiment is to rest today. I have clients and two Feldenkrais classes, so my “exercise” will be some gentle Feldenkrais and perhaps a bit of a walk. Tomorrow I will return to the workout room, and see if I can do five minutes on the elliptical machine. After a setback, we can’t always just “get back on the horse” immediately. I had to be willing to take small actions, slow down, stop, think, explore strategies, and allow things to re-integrate. To rush the process is unwise. Of course, I can apply this process and this new learning to other aspects of my life — namely, my overall recovery from burnout — to redefine setbacks as opportunities for learning. The resilience and new wisdom come from this process of ebb and flow, light and dark.